Name of alts we may know you as: None that I know of- Gear's all I've got right now. Location: From Manehatten, currently on the move. Sleepy after a long night of working! 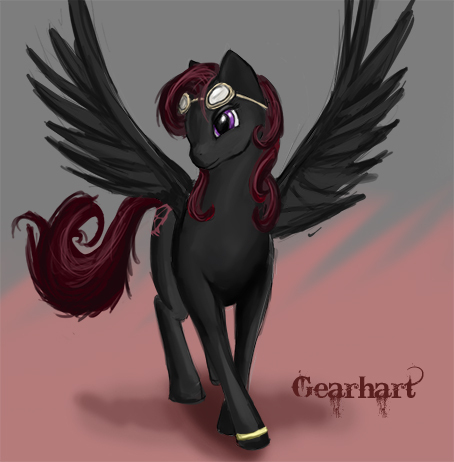 Gearhart is a dark gray, with a mane of maroons and a bit of pink. Her eyes are a purple, but of no unique shine or brightness. She's long-limbed, somewhat elegant, and her mane curls around her face and neck. Her cutie mark has two mismatched, overlapping gears, representing the continual struggle of invention she faces. Personality: Having turned her nose up at her family's history of cloud-related work, Gearhart dove into two main passions; invention and toymaking. She loves wind up things, contraptions, and useless objects that make people smile- she likes to be the one making the things that make people smile. She spent most of her youth in Manehattan, where she visited her uncle and later was admitted into the Academy of Science in the city. She instantly found school life not to her liking and felt choked by the structure. Only two years into her studies, she dropped out and avoided contact with her parents for fear of their rejection over her inability to remain committed to her studies. The guilt hangs over her head and she struggles with, in spite of knowing the passion represented on her flank, feeling aimless in life. She's outgoing, generally, though sometimes a little socially awkward. She loves fillies and colts, finding childlike innocence and energy endearing. She's got a strong creative spark, and approaches problems with a desire to find solutions, having no patience for complaining. Well. It wasn't exactly glamorous. With a sigh, Gearhart trotted into the dusty room she was to occupy, her back left hoof kicking the door shut behind her. The slam caused the ceiling to rattle, and dust drifted down from the exposed beams. It was musty smelling, but she supposed that's why rent was so cheap. Pacing the length of the walls, she gave a nod to no one in particular, it would do for a workshop. A sturdy table, a couple benches, shelving for supplies... it was certainly nothing like the well lit and shining studios of the academy, but she was getting it for only a few bits a week. Whoa.. Great work on your application! I love your References! Good job! i must say... and only one word. WOW. and i do mean that whole heartily. not only was your description on your character well in-depth and with visible listing of flaws and limits, your character seemed to shine so far above most of those i have seen. not only did your sample post reflect this, just in the entire design does it appear your character is very well-rounded. i must say, shes got a really firm grasp. Excellent Application, Flawless Reference Pics! I approve!